This little girl just will not stop growing up. Every day she is mastering some new milestone and coming into her personality more and more. Each moment is so fleeting and I am so grateful for images like these. THIS is why I do what I do and why I LOVE what I do. 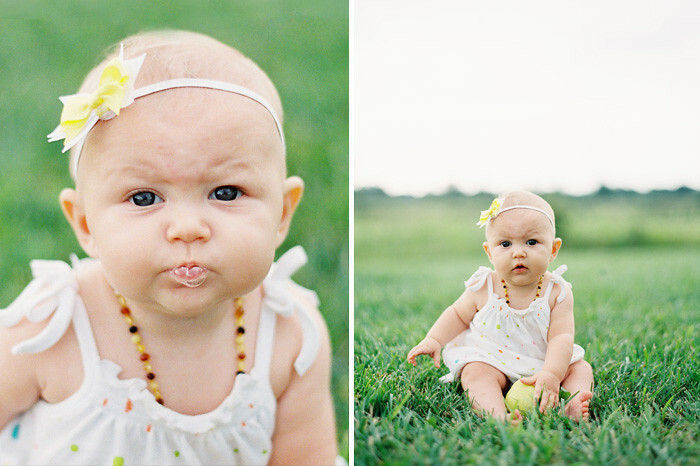 In these photos Adelaide is not quite six months old. And in twenty years when I look back on these prints tucked into her baby journal, I can promise you that I will sigh with my hand over my heart and smile to myself remembering her little spit bubble coos and how exciting it was for her to explore the new textures of pokey blades of grass and smooth, glossy apples. And how she scrunches her eyebrows and wrinkles her forehead when you take her picture.